HarpGear.com the home of the best harmonica and harp amplifiers! How to get better tone. One thing I find with quite a few players I run into is that there tone can be improved. Some have been playing for a short time and some have been playing for a long time. Sometimes I find a players acoustic tone is good but their amplified tone needs help. I will go over some basics here to work on to make your tone stronger and fuller. We are working on creating more resonance and to do so requires a large oral cavity. One reason some people believe that tongue blockers get better tone is because the harp is deeper in their mouth when they tongue block. I know plenty of players who are lip pursers and they have phenomenal tone. 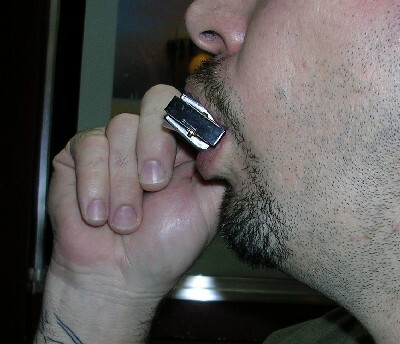 The key is placing the harmonica deep into the mouth and having relaxed lips like the picture below. This relaxed open embouchure is the key to good tone. This picture shows the harp deep in the mouth and the lips relaxed. 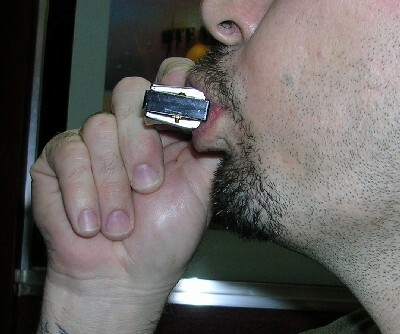 This picture shows the harmonica on the edge of the lips with the mouth closed and the lips tight. This position will make the harps tone thin and weak. I find a lot of players have the harp too deep in their hand while they are playing also. This leads to not having adequate room for the mouth to be on the harmonica. 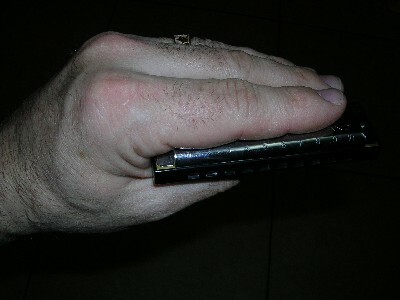 When holding the harmonica you want to have the harp tilted slightly down and your fingers at the rear of the harmonica. 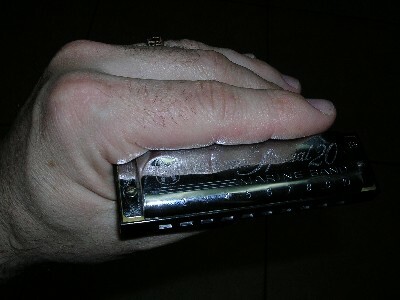 This picture shows the harmonica with the playing surface uncovered and ready for great tone. The harp is deep in the mouth. This picture shows the harmonica too deep in the fingers with no room for your mouth. See how little room there is for your mouth there? Notice how tight my mouth is here. Not much room for anything but thin tone. 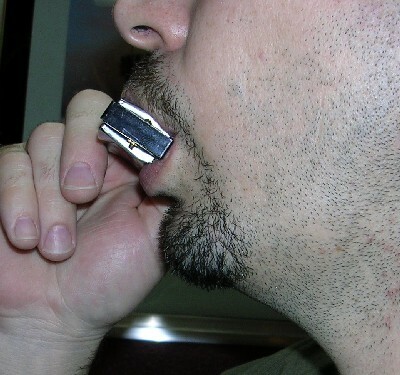 Now that you are holding the harmonica correctly we can work on placing the harmonica in the mouth correctly. Open your mouth wide and bring the harmonica into the mouth with the back of the harp slightly tilted up towards your nose. You want to bring the harp all the way into the mouth until the harmonica is touching the point where the top and bottom lips meet. Now gently relax your mouth onto the harmonica leaving the lips loose and relaxed. Now breathe into the harp. At this point it is impossible to do anything other than inhale or exhale to make the harmonica sound. When the lips are puckered on the edge of the harmonica you will find you are blowing and sucking like there is a straw in your mouth. This leads to a small mouth cavity and thin tone. We want to concentrate more on inhaling and exhaling. At first you may find it difficult to get a clean single note with the harp deep in your mouth. Tilting the back of the harp up towards your nose is going to help out with this quite a bit. The goal is to get your single notes to sound big round and full while they are sounding. This may take you a little bit but it is well worth the time and effort if you want great tone. The next step is getting the inside of your mouth big and open. 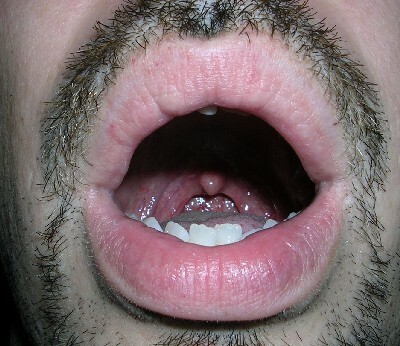 If you have your tongue bunched up in your mouth it is closing the tone chamber up and making the sound muffled and thin. You want to drop the tongue and press it flat to the bottom of the mouth to make as much room as possible in there. This position shows the tongue down and the throat open. This is a nice resonance chamber for good tone. This position shows the tongue up and blocking the oral cavity and making the resonance chamber small and ineffective. The next step is to drop the jaw and open the throat. While harp is in your mouth as described above you want to open your jaw as wide as possible without the lips coming off the harp. Then open your throat by simulating yawning. This opens the mouth and throat up as far as possible creating your biggest resonance chamber to give you that sweet round tone we're all looking for. This picture shows the jaw dropped and the throat open. Notice the slight bulge under the goatee. This picture shows the jaw closed and the throat not opened. No bulge here. The final step we touched on earlier was to inhale and exhale on the harp instead of blowing and sucking. You want to breathe from your diaphragm and not your chest. 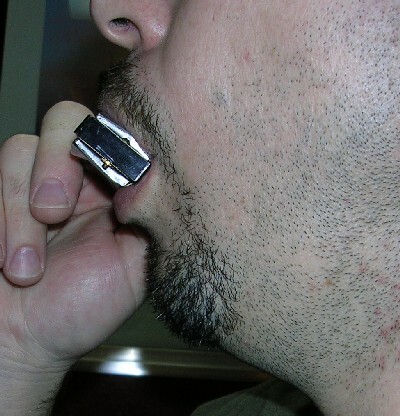 You should notice your stomach expanding as you inhale on the harmonica and it should contract while exhaling. If you are feeling your breathing in your chest and not your stomach you are not breathing properly. We'll work on this in the exercises below. Now if you combine all the above techniques and do some practice excercises you will have the best acoustic tone possible and be ready for the amplified harmonica techniques. When bend I actually move the back of my tongue and throat to do it. I leave my jaw in place and I slightly pull my tongue to the rear of my throat which causes the tongue to rise slightly in the back. When I say I pull my tongue I am using that as a way of describing the feeling of the movement. The actual movement on the front of the tongue is so miniscule it is almost nonexistent. When you "pull" your tongue back it causes the tongue to rise slightly. This redirects the air and causes the reed to bend. The front of the tongue moves back slightly but stays down. It is much the same as when you learn to bend tongue blocked. You can't move the front of your tongue too much when you are tongue blocking because you would lose the clarity of the note. A lot of players bend using their jaw and tongue but notice the jaw more. This method of bending is more like forcing a bend. Just using your tongue and throat is like finessing. Try while inhaling on the 4 hole of your favorite harp to pull the tongue back while keeping it flat in the front and allowing it to rise in the rear. You will feel the pull in the part of your throat where the jaw and throat meet on the bottom side of the back of the mouth. You should also notice the back of the tongue is coming up so slightly. This isn't easy at first and it is why a lot of players have problems bending while tongue blocked. The bend should sound if you are moving the tongue right. If you are getting the bend and it is right you will be able to hold your jaw and feel it staying down and not moving. While I am bending I can feel the muscles in the area where the jaw meets the throat moving up slightly but the front of the jaw is stationary. This will take some time to get but when you do it will allow you to bend while tongue blocking or lip pursing and with great tone. I am not saying that bending the other way will not give you great tone. This way will just allow you to open the oral cavity more and create an even bigger resonance chamber. This was a little hard to describe but I am more than happy to answer any questions to help clear it up. Here at HarpGear I love when everyone participates. After reading the article Stephen Schneider wrote me to add a few more details on what makes good harp tone. If you have an opinion on any of the topics I write on feel free to let me know and I will add it to the rest of the information. I think the emphasis on getting the harp deep in the mouth is not necessarily only to promote internal resonance, but also to simply physically seal off more holes on the harp from the outside air. If someone wants a fully dark and compressed tone, they need to use some combination of their lips, tongue, face and hands to completely seal off all the mouthpiece holes and the coverplate openings. It's not necessary to use all four--that's why lip blockers can get a good tone--but it's all gotta be relatively sealed up to create the darkest end of the tonal spectrum, and getting the harp deep in the mouth takes care of a lot of holes that then don't need sealing off by the hands, cheek, etc. That's especially important if someone wants that full-on Big Walter/Dennis Gruenling tone. But Kim Wilson's a good example of someone who leaves a bit of the coverplates open on the end and works the remaining tonal spectrum well. Ditto for Little Walter, I think; the clue is whether the high end of the harp sticks out of the hands or not. Filisko discussed these two schools at his tone seminar at the Minneapolis Summit in 2000. Either way you do it, closing off mouthpiece holes is one key to creating the dark end of your tonal palette, and getting the harp well into the mouth does that automatically. The teeth are really shaped like a half-circle in front, so pushing the harp deeper automatically creates a bigger chord (geometry, not music) across that semicircle, covering up more holes along the mouthpiece (it's part of blocking octaves too, for example). The way I understand it, the short-wavelength high freqs travel mainly through the air, so you are trying to develop a relaxed position where you use your body to damp out that "acoustic-sounding" element of harp tone by sealing off the instrument from the open air, yet can open your cup for brighter tonal shadings as part of your phrasing when you want to. The dark, deep, compressed end of the amplified harp tonal spectrum is the part that's "artificial," if you think about it, not what the general public thinks of as the natural sound of the harmonica, so it's the part that will require more conscious effort when you first start to learn it: how you are holding the harmonica, how deep it is in your mouth, your internal resonance, how you are sealing things up. The bright end of the spectrum sort of takes care of itself if you reverse that: open your hands, let the focus of your internal resonance move forward in your mouth toward your front teeth, and things will brighten right up. I'm not sure whether I habitually move the harp to a less shallow position in my mouth to get brightness. All this stuff, at some point, will be taken over by your body and executed unconsciously if you focus on the tones you are getting. It's kind of a Zen thing: Play the music, not the harmonica, not the mic, not the amp. Imagine sounds you want to hear, and you'll be surprised how your body can deliver them without conscious directions. You are just trying to train the habits that deliver you to that point.